To be an innovator, a broad knowledge of basic sciences that makes it possible to find and solve new problems over multiple fields is required on top of a deep specialty deserving of a doctorate. 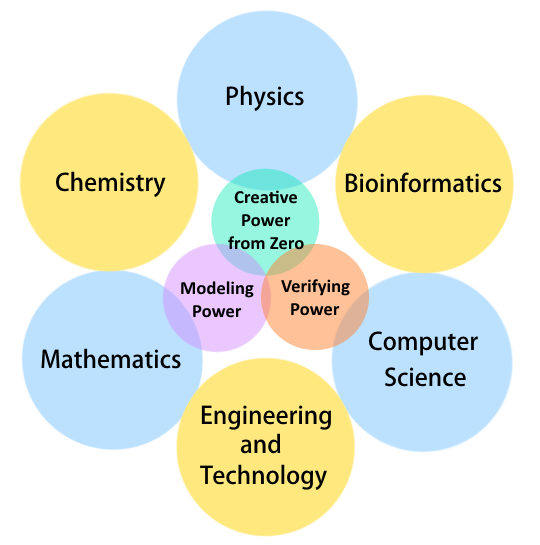 Especially, the abilities in Physics, Mathematics, and Computer Science need to be improved in order to cultivate the following powers which make you possible to innovate flexibly under changing conditions: “Creative Power from Zero”, “Modeling Power”, “Verifying Power”. In addition to those abilities, the knowledge learned from different specialties can widen your perspective. This program provides the courses that strengthen such basic abilities required for creating innovations. All classes in Innovation Creation Fundamental Courses are taught in English for training to utilize your expertise under global circumstances.